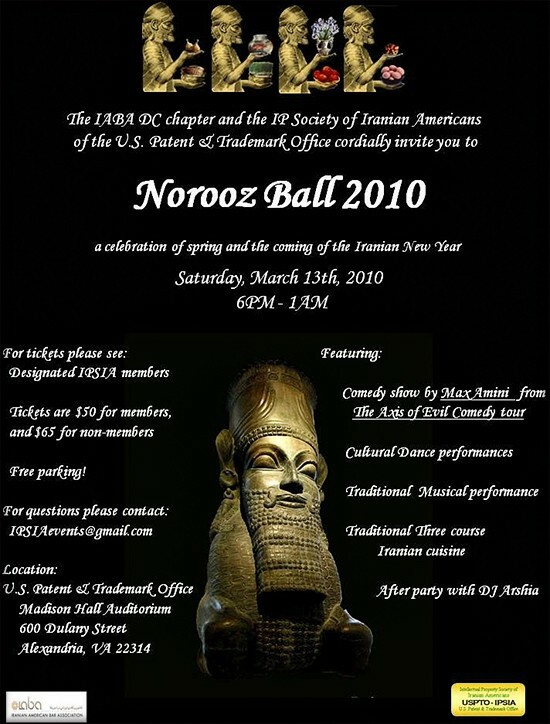 The IABA DC chapter and the IP Society of Iranian Americans of the U.S. Patent & Trademark Office cordially invite you to Norooz Ball 2010. Comedy show by Max Amini from The Axis of Evil Comedy tour, cultural Dance performances, traditional Musical performance, traditional Three course Iranian cuisine , and after party with DJ Arshia. * IABA Members: member will be able to purchase 4 tickets for $50 each (including children), until February 19th. After this time, tickets for members will increase to $65. * IABA non-members: $65 per person at all time.